There was as much interest off the track at Monza as there was on it. Get up to speed with the Italian Grand Prix debrief. The final race of the European season always brings fanfare and attracts in ther bigwigs – not least because logistically it’s the last chance to show off F1’s splendours – and there were talking points aplenty. From FIA President Jean Todt’s parade with Liberty heads to the movements of McLaren and Renault team bosses going in and out of various hospitality bases. While English football enjoyed its traditional transfer deadline day at the start of the Italian Grand Prix, F1 was bracing for its own deadline day as dubbed by a number of journalists in the Monza paddock. Sunday night, specifically 6pm, was billed as the point of no return on a potential engine deal being announced but the clock struck the hour and not a peep from any of the key players. 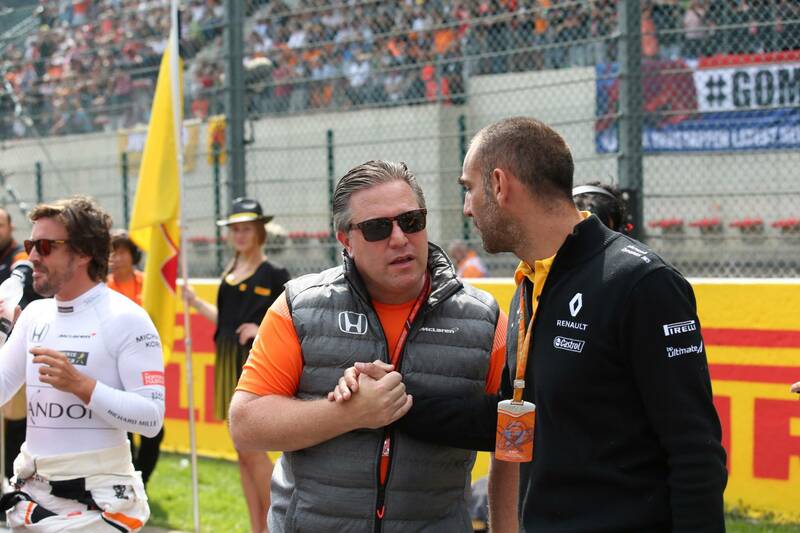 Eric Boullier, McLaren-Honda team manager, remained remarkably tight-lipped speaking to reporters after Sunday’s race but did say a Honda board meeting wouldn’t include any McLaren representatives, while they had no shiny new contracts dripping with fresh ink from Renault. Cue the rumour mill going into overdrive. Staying with Honda, switching to Renault, Toro Rosso picking up Honda in an engine supplier swap, while Zak Brown went as far as to hint McLaren could build their own engines with some external help, but that seems unlikely until the change of engine regulations for 2021. In a weekend of uncertainty, McLaren are certain about one thing: a deal will be struck before Singapore’s race in two weeks. Design work and developments on 2018 cars have been stalled long enough that if the negotiations rumble on any further it could have a detrimental effect on the team’s car compared to its rivals regardless of what powers it. Then there is the immediate future of the drivers. Fernando Alonso is adamant he won’t make a decision for 2018 until he knows what each team will pack in its armoury, including away from F1, while the lingering rumour of Carlos Sainz Jr. breaking into Renault also refuses to fade away. And where does Robert Kubica slot into this? The Pole was present in the Monza paddock and even if his fairytale return at Renault fails to materialise there are enough teams sniffing around. In the country which defined what romanticism meant there was a love-in on Sunday morning with a public message being sent out. Liberty’s arrival as new F1 owners sparked into life 12 months ago and to mark the occasion Ross Brawn, Chase Carey and Sean Bratches – the tri-human which replaced Bernie Ecclestone – strolled up and down the Monza paddock with FIA President Jean Todt. If it wasn’t for the commotion of onlookers and photographers they could have easily been holding hands. But was it all strategical? Back in May Todt officially announced his plan to run for a third term as FIA President and while no candidates have thrown their hat into the ring if the ex-Ferrari boss can keep the new owners on his side he’ll effectively hold the majority of the key players. That may mean he might not even need to face a campaign. During Friday’s FIA team principal press conference Mercedes boss Toto Wolff spoke of his respect and admiration for his counterpart Maurizio Arrivabene sitting alongside him. The words probably ring true but it’s easy to be respectful to an opposition when you have a plan in place. And what a blow Mercedes landed on Ferrari on its home turf. Yes, Mercedes were always fancied to win at Monza due to its power unit advantage but very few people who have predicted such a walk in the royal park for the Silver Arrows to slide a dagger into Ferrari hearts. Hamilton escaped up the road before Ferrari could get close, aided by the jokers in the pack Lance Stroll and Esteban Ocon, but the way Valtteri Bottas not only repassed Kimi Raikkonen but seemingly pulled away at will would have been painful viewing for all those in red. Whether it was the oil burning trick from Merc's new engine package or just the plentiful straights allowing Hamilton and Bottas to stride away, a 30-second gap in a race which lasted just 75 minutes would feel like a lifetime after all of Ferrari’s promising work so far this year. But then came the statement of authority. First from Hamilton, who before the race wanted to rub the smile off Sebastian Vettel’s face, gleefully stated “Mercedes power is definitely better than Ferrari power” on the podium in front of the frustrated Tifosi who booed him. Then Toto Wolff, the respectful one, said he thought Ferrari “had taken a step back” in its development. This was Mercedes saying, you’ve done well so far Ferrari but this is our world crown and you are getting nowhere near it. Will it be a Mercedes whitewash until the end of the season? Probably not with the likes of Singapore and Brazil to come but the heavy majority of tracks favour the Silver Arrows to keep on flying. On Thursday morning the Monza paddock was host to a rather unique spectacle. Usually banished out of sight, the Formula 2 world joined its much bigger brother to reveal the 2018 F2 cars – the first time something like it had ever been hosted in the F1 paddock. Liberty and the FIA are keen to add value to the show and giving F2 a more prominent billing would be an easy win given one race can often possess as much excitement as an entire F1 season. Visually and technically the new F2 cars have been designed to reflect the fresh look F1 has for this year while it also included the Halo. Like or loathe it, at least for the immediate future this is how single-seater cars will look. However, it was far from the finished article with the model car carefully balancing the Halo device above its cockpit while the bodywork was impressive for afar was far from the finished article when close up. A move to the future but the journey is far from complete.